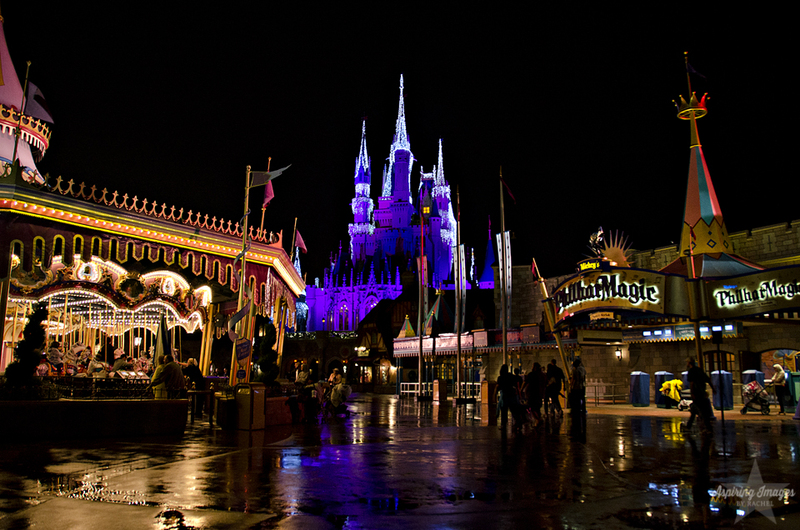 I know I've said this before but there is nothing better at Walt Disney World than seeing the Magic Kingdom AT NIGHT. Most people never make it to the evening, especially when traveling with younger children, but I feel like you are really missing out if you don't go visit all those amazing lands of Magic Kingdom in the cloak of darkness. Dare I say, being there at night actually makes the fantasy and imagination even more intense and amazing (yeah, this Disney nerd is totally all for that). Recently, my cousin and I decided to head to Magic Kingdom for the evening and hit up one of it's late night openings where you can wander the park until way past the midnight hour when Cinderella's coach turns back into a pumpkin (also known as the hour when those who hit the park at 7AM can't bear to be on their feet any longer). Typically, everyone makes it to the evening fireworks and then the masses start exiting the park and it gets much quieter and the lines more bearable. So, what could make it not so fun at night? Rain. For the normal person, rain just makes thing all sorts of......soggy. I mean, walking around in wet shorts and soggy shoes is definitely on the list of torture somewhere. Well, this photographer was super STOKED when it was raining - especially when I knew it was going to pass and then leave an amazing reflective light on the ground. The rain did mean the evening parade was cancelled but I feel like I got the better deal. I saw a photographer I admire get some beautiful shots post-rain and I had been yearning to try my hand at it and fiiinnaaalllyyy got my chance. My poor cousin was then dragged all over Fantasyland (original and new) with me while I tried to get the shots I had dreamt of in my mind. I tried to pay him in Turkey Legs but he preferred bottles of Coke and those chocolate covered pineapple desserts at the Big Top Souvenirs and Treats in Storybook Circus. Haven't tried them yet? They are beyond fantabulous and they go quickly. I like to pick a wall to sit on and eat them while watching the Dumbo Ride. I promise - you'll become addicted too and then you can join the club. On a side note, I do have to say, my family and friends deserve medals and great honors in their name for their patience with me while traveling. They always let me indulge my photo taking needs, which typically includes me saying "Wait, I want to take a pic here" and everyone then stop and finds a place to lean or rest. Seriously, they are the best. You guys know who you are. See the very first picture of the fireworks? In my eagerness to find a better spot to stand while watching them, I wasn't watching my step (it was also already dark and I was ignoring the warnings over the speakers saying it was dark and to be cautious) and I did the infamous step forward but it was actually a step DOWN. My cousin was behind me and one moment I was moving forward and the next I just dropped like a rock about 4 inches below where I was and did the wheeble-wobble-regain my balance and arms flailing while falling forward to avoid face planting thing.....in the semi-dark.....with tons of people around. When I regained my balance, I looked around and many people had that "Yup, that's what you get for shoving yourself into a better spot" look on their face. In the end, it was worth it so phooey to those people I'll never see again. My cousin said it was beyond hilarious to watch. I am here to entertain, folks. 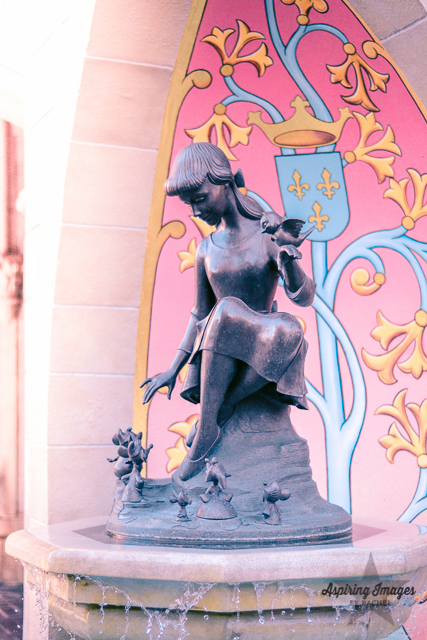 What's your favorite time to visit the parks at Disney? Do you have a favorite "must have" treat whenever you visit? Does anyone else avoid the water rides, like me, to avoid the soggy torture?